What's inside a constant voltage constant current power supply used for Electrophoresis - the separation of particles in a fluid by using an electric field. You can get these supplies quite cheaply on ebay if you look around. 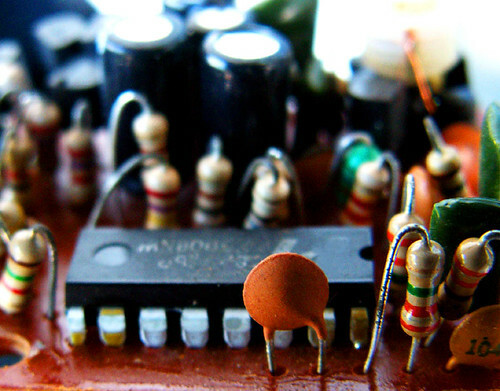 A quick reverse engineering of the circuit provides some insight into what's happening. Sweet! I have one of these supplies. One of these days I will actually use it for something! hi , i wonder if the front end of the rigol DS2072 or DS1052E could blow up even if u use a HV probe? To my knowledge HV probes are essentially 100x but input is still higher then 300Vrms. 300Vrms is the absolute max front end could handle. Well, Dave, I am sure if I was designing a high voltage power supply, I wouldn't do it like that! A worrying number of bodgetastic wires and components for a production unit. Thermal performance of a hex spacer, anyone? Good grief. Am I reading it right that this is essentially a crude switching power supply, with no main capacitor on the rectified AC off the transformer? That would explain the output ripple, but not the lazy low frequency instability. I guess that could be a software loop issue. The opto isolater circuitry could be something to do with shutting the ouput down the moment the AC is switched off? Again, there might be other cleaner ways of achieving that from the secondary side, but there you go. And you say they are no longer in business? Hmmm. Maybe the goofy galloping output has something to do with the electrophoresis process? It would seem if you just need a basic constant current power supply that there's a lot easier ways to do it. What an odd topology that is. It seems to behave like a thyristor rectifier, but with an IGBT instead. The gate pulse arrives just before the optocoupler pulse, which suggests to me the microcontroller receives the opto pulse (zero crossing) then runs a timer before turning on the IGBT. The timer length being dependent on the output voltage (just like a thyristor firing angle). The fact that the IGBT is only switching at 100Hz means the control loop is going to have to be running at a really slow bandwidth (in the order of 1-10Hz), which is why you're getting low frequency oscillations. I think the output of the rectifier remains charged up at the peak because it is floating (no load) and the parasitic capacitance in the diodes is holding it there. If you put a small load directly on the output of the full wave rectifier it might clean up the waveform so you can see more clearly what's going on. Or you can probe the AC side and rectify the signal in your head. Looking at where the IGBT gate pulse is with respect to the AC zero crossing will be able to confirm my theory of thyristor rectifier like operation. Another thing to try is looking at where the gate pulse arrive with respect to the opto when you have a higher output voltage. The gate should turn on earlier/maybe for longer with a higher voltage. What value resistor are you using for a load? The expected load is a tray containing a buffer solution (and a slab of polyacrylamide gel, but that doesn't really impact the small ions; it just slows down the big ionized molecules, which are present in numerically insignificant molar concentrations) This is a far cry from a low-ohm power resistor -- esp an inductive wirewound. I can't believe it that I've forgotten the composition of the buffer solutions I used for nucleic acids (why not? I've forgotten everything else I knew 25 years ago! ), but since these power supplies also ran protein PAGE, normal saline should be well within spec as a buffer, and you can EASILY make a batch of that -- it's just 0.7 g (a heavy pinch) of table salt in a liter of water. Any impurities in table salt and tap water won't matter -- we were always adding chemicals to the normal saline base solution for various purposes anyway, with never a second thought to the conductivity. Pour a shallow layer of normal saline in a tray, and place electrodes (carbon rods from inside dead alkaline batteries would be nice, but nails will do) between 15-50cm apart in the tray. Easy peasy. Still kind of sound weird to me that PSU with output below 1kV called "HV". I always wanted to look inside one of those Bertan supplies. I had one on loan, to play with PMT tube project I had at the time, it had negative 10kV out but screws were sealed so I could not look inside. It had an output connector that looks like BNC but it is NOT, - special, hard to find HV connector type with heavy insulation. Still looking for opportunity to buy one of those. I seem to find one ore another interesting project where I can use low current HV supply every weekend. I'm still looking for something useful to do with mine. The resistance of the electrophoresis chamber varies a lot, depending on type, dimensions, and on the saline used. However, a typical value for standard agarose gel electrophoresis to separate DNA fragments would be somewhere around 100 kOhm. Typical voltages range from 50-150 V. Depending on the gel used, gels can heat up and melt at higher voltages. Run time is usually between 0.5 - 2 hours. During this time, the resistance of the gel can increase. To get quantitative results independent of the changing resistance, the sample runs in parallel with a know "DNA ladder" that has fragments of known sizes. Thus comparing your result to this ladder gives you a calibrated read-out, no matter how much voltage or current changed. Thus, this techniques does not need any precision voltage/current source. I am just astonished for what prices these simple devices are being sold. I have an older 1000V 100mA electrophoresis power supply from a different brand which uses a triac in front of a 220V->1000V transformer. The crude regulation with no regulation after the smoothing capacitor seems to be common to electrophoresis power supplies. Beside constant voltage and constant current, it has a constant power control. The regulation is completely analog using an analog multiplier for the constant power mode. The IGBT based regulation looks similar to the triac based one: The IGBT is switched on near the end of each cycle and stays on until zero crossing. When set to a higher output voltage, the switch on timing is shifted towards the maximum of the sine wave. I think a SCR instead of the IGBT would also work with almost no changes to the control circuit. This kind of regulation was used in TVs from the 1980s (or 70s) to provide stabilized 150V for the horizontal stage. Why have you basically switched entirely to the Rigol DS2202 for the last several episodes rather than your Agilent Scope? Did something happen, or do you just prefer the Rigol now? The Rigol sits on my teardown bench. The Agilent sits on my working bench up on the instrument rack. I simply use whatever one is within reach. oh, okay. Figures it would be something that simple. I just noticed you hadn't used your Agilent in a video in months (unless I missed something). "Thus, this technique does not need any precision voltage/current source. I am just astonished for what prices these simple devices are being sold." As someone who ran a biomedical research lab for years and used protein electrophoresis, I agree that accuracy in a power supply is not that important. Being off by 5% on current or voltage and having some ripple is not a big deal. The distance traveled by the various fractions being separated is usually compared to a standard. Having consistency from run to run is important though. I remember looking at the innards of an electrophoresis power supply years ago and was surprised at how simple it was. Anything bought through a biomedical supplier has a big mark-up, and lab managers are pretty good at avoiding buying from them if they can get the same thing elsewhere. A good example is refrigerators which can cost several times more from a biomedical supplier compared to a discount appliance store. High voltage power supplies don't fall in this category though, so the price is high. Forget most biomedical researchers building their own; they don't have the knowledge or time or interest. So 0.7%. Ah, close enough (assuming you not injecting it). if you do a follow up , I would love to see the transformer up close. I use my EC supply for destructive testing such as insulation or dielectric limits in wires. Sorry to necropost, but I stumbled across the instruction manual, test procedure, and schematics for this unit while looking for manuals for some different ones that I've acquired. Might be helpful for someone else in future. Click through on the download link for the "Thermo Power Supply 250-90"
So the "EC Apparatus" business/design was obviously bought out by Thermo Electron, which later became the current Thermo Fischer Scientific. Interestingly the schematics have yet another company name - "Savant Instruments, Inc", and are dated May 1995, with last update in May 2002. So obviosuly there is some history behind this device and the design passing through several acquisitions/mergers, as is often the case. I am sorry for reviving an old thread, but you're the only one I've come across who even mentions repair on this Brand. Did You find any schematic of EC-452? Can You post it here? Unfortunately common x10 and x100 probes do not attenuate DC when the oscilloscope input is set to AC coupling. What happens is the AC coupling capacitor charges to its breakdown voltage through the probe's series resistance and then breaks down. You might think that having 9 megohms or 99 megohms in series at the probe tip would limit the current but the capacitance of the probe cable after the series resistance stores significant energy at high voltage because of that pesky squared term which immediately gets discharged into whatever protection circuitry the oscilloscope has. 500 volts probably will not do it but 2000 volts sure will through a x100 probe. I have heard it before; it makes quite a *snap*. Some oscilloscopes will survive this and some will not. That power supply does not strike me as a very good design. I had an unfortunate incident which taught me to use as little capacitance as feasible on the output of a high voltage supply.